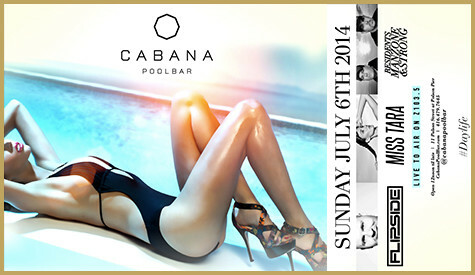 The summer is here come cool of with us at Cabana Pool bar while jamming with DJ Miss Tara on Sunday July 6th. MissTara was at it again doing what she best knows to do. Her DJ skills which have since developed and comfortably taking its spot at the top since she first came in contact with the 6 man DJ group in Paris at the time when life handed her lemons which she has expertly, with dedication, passion and her sheer love of sharing happiness on the dance floor squeezed out lemonade to enjoy. According to Miss Universe records,C MissTara gave a description of how she branched out into music from being a physics student. “When I finally arrived in Paris, I went straight to the hospital. After having a CT scan done, it turned out that I had been bleeding in my brain for three days. I was diagnosed with AVM, also known as “Arteriovenous Malformation”. They then transferred me to another hospital; I had an operation to stop the bleeding and stayed in the hospital for two weeks. Welcome to Paris! After I was released, I was not allowed to go on a plane, as I had to wait until all the dead blood was completely absorbed so they could perform the second brain surgery to treat the malformation. This whole thing took eight months and put me out of business and school, blowing up my life savings. I was depressed, but at the same time I was very happy to be alive. I spent those days in Paris recovering in “Paris style.” In doing so, I made a lot friends, a group of which happened to be six DJs that run a music company together. Little by little, I realized that my love for music was not just restricted to dancing, but also to making music, mixing beats, and understanding people’s emotions and dance behaviors. I decided that I actually really wanted to make music and make people dance. I started mixing right away in Paris and that’s how I became DJ Miss Tara! This experience changed my perspective towards life. I realized the richness of life lies within the love and care that surrounds me and not by my balance sheet”. She clearly has her perspective right.